Nations rarely appreciate their navies…until they need it. Australia is no different. The Naval Diplomat did a double-take while wandering the defense contractors' exhibition halls in Sydney last week. This isn't uncommon, actually. Such displays always have a surreal feel to them. They typically feature photos or mock-ups of golly-gee weapon systems — implying that the casual visitor can whip out his MasterCard and take a Joint Strike Fighter or guided-missile destroyer home with him. For my money the best galleries were historical in nature. Several recounted the Royal Australian Navy's century-long history while paying homage to its pre-history — in particular to the Great White Fleet's port call in 1908. The visuals were simple and effective, deploying timelines, photos and ship models. Simple is good. One anomaly caught my eye, however, since I'm a relative newcomer to studying the RAN. The newly built battlecruiser HMAS Australia headed the new fleet's procession into Sydney Harbor one century ago. Despite her youth, Australia, the only capital ship ever to serve in the RAN, was decommissioned — not to mention scuttled — less than a decade later. This despite rendering good service in World War I. What gives? Arms control is a fine thing on balance, but sometimes it does perverse things. So do imperial powers. The postwar naval arms accords capped the numbers, tonnages and capabilities of men-of-war for the world's leading fleets, including Great Britain's Royal Navy. As a Commonwealth force, the RAN remained an appendage of the Royal Navy and counted against British ship totals. London ordered Australia dismantled to help the Royal Navy comply with treaty limits. So much for the RAN flagship. Needless to say, seeing the pride of the RAN scrapped sat poorly with Australian seafarers, who joke about it to this day. But maybe history is looping back to the 1920s in a limited way. A pal of mine (and of many others at the Naval War College), Captain Lee Goddard, recently oversaw an effort of significant moment for Australia's navy. Operating in the firing range off Hawaii last August, Lee's command, the ANZAC frigate HMAS Perth, engaged seven sea-skimming targets with Evolved Sea Sparrow Missiles. Perth demonstrated that it can take on the deadliest threats out there. In short, the ANZAC ships now appear to be viable battle-force ships as well as what they always have been, doughty light combatants for policing more or less tranquil seas. Perth or her sisters could show up for picket duty with U.S. Navy carrier and amphibious task groups. Or they could serve with intra-Asian squadrons alongside the likes of India's or Japan's navy. One hears echoes of HMAS Australia, a capital ship that does Canberra's bidding in RAN missions or takes station with a combined fleet. And yet, best I can tell, the Perth missile shoots occasioned nary a murmur in the press, even in Australia. The RAN ran a lonely press release. Apart from that, crickets chirped. Why overlook a feat of this magnitude? The facile explanation is to blame Australia's "sea blindness," or lack of a nautical culture. And there's something to the facile explanation. If national defense is all about land and air forces, and if war at sea is as improbable as learned experts maintain it is, then why should bolstering readiness for sea combat excite the public fancy? The character of naval operations also complicates matters. Navies do their work mostly out of the public eye. This is an advantage for the most part, as it lets commanders and national leaders dial up or down the degree of force they apply in given circumstances. But at the same time, the offshore character of naval endeavors works against efforts to rally popular support for sea power. A navy looks like an expensive, wasting asset … until you need it. Its contributions are invisible, the dangers it exists to combat remote- and abstract-seeming. 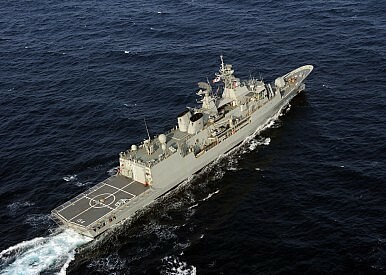 Unless some immediate, pressing seaborne threat emerges, culture-building could remain elusive for Australia's navy. Much will come down to the skill of RAN and government communicators. RAN leaders such as Vice Admiral Ray Griggs, the nation's top uniformed naval officer, now speak of cultivating a "maritime school of strategic thought for Australia." That's a good start. Studying and applying the classics of maritime strategy is never a bad thing for sailors, soldiers and airmen. But instilling a culture involves more than conveying ideas or factual knowledge. It means priming people's instincts to react to certain events in certain ways. That means rousing primal passions, not just engaging the intellect. Dispassionate explanations of why sea power is important are apt to disappoint. Strong bureaucratic signals can reshape the culture within military services. But there are no guarantees, even then. One recalls Franklin Roosevelt's joke about the "na-a-vy" being a pillow that sprang back to its original shape no matter how hard or how often senior officials punched it. Consciously molding a nation's culture is even harder, since officers and public officials preach to a congregation that may or may not listen. Mahan admitted that his project of cultural reform — of weaning the American people away from small-navy thinking — languished until the Spanish-American War vindicated his ideas in the popular mind. The same fate could befall RAN efforts at cultural management. I hope the Australian leadership fashions an outreach program that doesn't demand a Spanish-American War or a Pearl Harbor to provide its oomph. Barring some dramatic event on the high seas, however, one suspects this enterprise could span generations. The Naval Diplomat delivers remarks at the International Fleet Review 2013, in Sydney, Australia.